While staying at the 19th green guesthouse there is no doubt that you are in one of the best locations to base yourself for a stay in Kerry. One of the most popular daily excursions for the 19th green guesthouse is a trip to the world famous Dingle & Slea head Peninsula. Dingle & Slea Head Peninsula in known in Archaeological circles for its wide array of ancient monuments. It is due to the Peninsulas remote location and lack of any specialised agriculture that there is a remarkable preservation or over 2000 monuments. It is impossible to visit Dingle Peninsula and not be impressed by its heritage. The Dingle Peninsula or in the Irish language –Corca Dhubhine is the northern most of the mayor peninsula in County Kerry. It ends beyond the town of Dingle at Dunmore Head. The western end of the Dingle & Slea Head Peninsula is a Gaeltacht Area (Native Irish Speaking) that has produced many notable authors and Poets. This area is jokingly referred to as the “next Parish to America”. 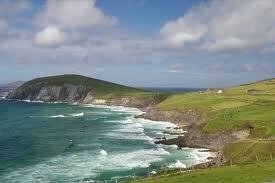 Dingle Peninsula & Slea Head has a long running history with Hollywood and the great Film Industry. David Leans 1970’s film “Ryan’s Daughter” starring Robert Mitchum takes place at a village on the Peninsula and was shot on Slea Head. In 1992 “Far and Away” directed by Ron Howard was partly filmed in Dingle, staring Nicola Kidman and Tom Cruise. 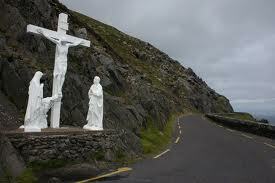 This is a circular route not unlike the Ring of Kerry, beginning and ending in Dingle Town. The drive takes a good ½ day and should be travelled clockwise in order to avoid the large coaches that travel the route. This drive is also a magical route for cyclists. The drive initially takes you from the town of Dingle to Ventry,here there is a fantastic “blue flag” beach which means it is safe for swimming and other Water sports. On leaving Ventry you head for “Slea Head” itself passing Dunbeg Fort on your right and Sheer Atlantic Cliffs on your left. SleaHead itself is marked by a stone – Crucifixion Scene. On your route back to Dingle there is a museum of note in Ballyferriter and the cliffs seen as you pass through Ballydavid are spectular. Brandon Creek is famously known as the starting point of St Brendan’s Voyage to America centuries before Columbus. So there you have it, not only did the Irish build America we found it in the first place. Imagine all this history and information when you stay at the 19th Green Guesthouse.